Pantry & laundry room closet organizers with custom shelving in Boston MA. "Bill, Simply said, I feel so organized!! Not only do I love the pantry, but all my friends want one like it, too. I have enough space for all of my pots and pans AND my favorite big mixer. It’s just so nice to put things in their place, thanks to you." What is the key to cooking a delicious meal? Being able to access what you need when you need it; a dash of spice, another can of tomato paste or just the right serving dish…. you don’t need to be a top chef to have a pantry worth loving. 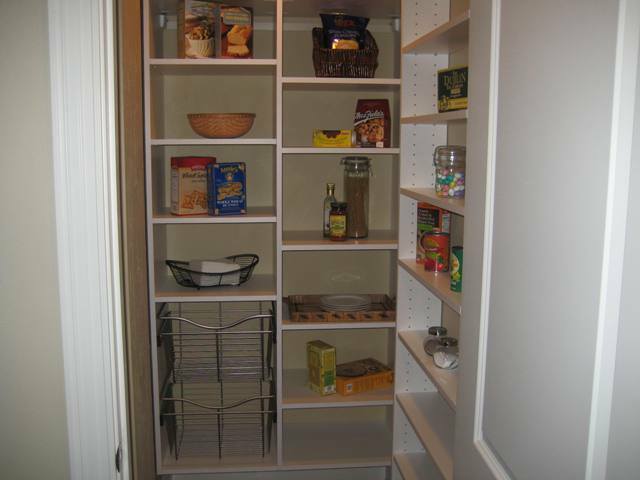 Whether you need storage for bulky appliances, canned goods or fine china, Kustom Klosets can tailor a pantry space to your needs. Our adjustable shelves are great for many sized canned goods and cereals. We offer slated vertical shelves for your tall cookie sheets or even for brooms and sweepers, Nickel baskets, soft close doors and drawers can compliment any pantry space. Not many of us love to do laundry, but if your laundry room is a cluttered mess it will only keep you from getting it done. With an organized laundry area that is efficient and user friendly, you’ll have space to tackle the task and get on with your life. Does the area where you keep your detergent, bleach, spot removers look like the set of a mad scientist’s laboratory? Kustom Klosets will create space in your laundry area for all the things you use everyday. Covering Boston and surrounding communities.